The Qi Gong Massager is a professional grade massager that requires less than 10 minutes out of the box to become an expert user. It’s hard to beat this instrument for fast pain relief, inflammation, and relaxing tight muscles for horses, people, and dogs. By far the best instruments I’ve ever used for fresh acute swellings. With only an on/off, timer, low, medium, and high selections to choose from, this is a “no brainer ” unit to use. What makes this unit unique from ordinary massagers on the market is that its proven results have allowed it to be classified as a FDA approved therapeutic massager. Your horse can benefit by the same device used by professional massage therapists and chiropractors nationwide. The massagers are placed on various parts of the body to improve healing and relieve pain. It can be applied directly by a therapist or self applied. You can also benefit from the Qi Gong by being near it, i.e. suspended or laying near you. Each session is 10-20 minutes, 1-2 times per day, however frequency and duration vary depending on the condition being treated. Temporarily increases local blood circulation. Temporarily relieves minor muscular pain and tension caused by fatigue or overexertion. Reimbursable insurance billing codes for doctors: 97016, 97124, 97039, and 97139. Introduced into the USA ten years ago with over 10,000 machines sold. The Chinese Ministry of Health has registered the massager as an approved medical device, which can help the following conditions: Shoulder Pain, Arthritis, Carpal Tunnel Syndrome, Back Pain, Neck Pain, Menstrual Cramps, Chest Pain, Asthma, Digestive Disorders, Hypertension, Sprains of Ankle Joint, Stiff Neck, Stress, Sciatica, Soft Tissue Injury, Sports Injuries, Muscle Cramps, Peptic Ulcer, Knee Joint Pain, Tennis Elbow, Bursitis, and Collateral Ligament of the Knee Joint. The Qi Gong Massager was a product developed from utilizing studies done by the Chinese Health Institute twenty years ago. The Chinese Health Institute studies were conducted to determine what healing energies were being emitted from healers of China called Qi Gong Masters with a scientific approach. Results of these tests confirm the Qi Gong Masters were able to control and emit more energy than the normal or untrained persons. These Qi Gong massagers are made of non-intimidating durable equipment with simple controls. They are safe and simple to use with easy treatment methods. Pain relief can be delivered directly, close to the site, or through thin blankets and wraps. The transducer can be used directly on the hair or skin or held 2-3 inches away. You can protect the head from dirt and hair by covering with a breathable wrap such as a thin sock. Are equine treatment sessions longer than treatments on people? Treatment sessions can be longer when doing a general massage covering the whole body. No side effects to worry about. The Qi Gong Massager will not burn tissue or cause irritation. 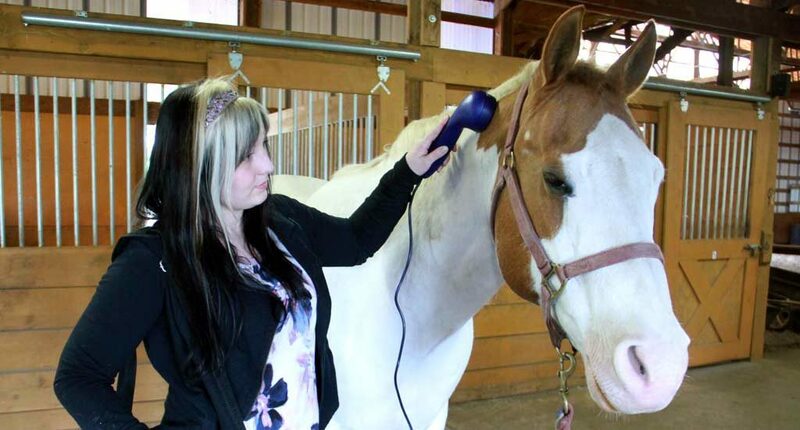 For the same reasons infrasound massagers benefit people, they can be used on our horses and other animals. Owners, Trainers, and Therapists have been using Qi Gong units for years as a valuable tool to help acute and chronic conditions, such as Arthritis Body Soreness, Breathing Difficulties, EMP, Colic, Muscle Spasm, Navicular, Joint soreness, Hematomas, and Stocking Up. Infrasound therapy can be incorporated with your traditional veterinary care as an additional support system. Use before Chiropractic to soften and prepare muscle tissue, particularly along the spine, for 20 to 30 minutes. Chiropractic manipulations may hold longer and even reduce the need for frequent adjusting. With regular use after exercise you can release tight sore muscles, soften tissue swellings, and help dump toxins. The Matrix Qi-SP shown with two options fo transducers. Plus, treating the horse’s poll with the handheld transducer (Qi SP is in the shoulder bag). The most dramatic effect is on a horse’s fresh swelling or edema. Ever had a horse kicked in the chest with a resulting hematoma? Don’t be surprised by how fast the swelling is reduced, usually with 2-3 treatments of 10-15 minutes. Or how about those difficult to treat swollen knees? Catch it fast and a couple of treatments should do it. Most people report it as the favorite for tight muscles. It works perfectly for gliding over those hamstring muscles, for soothing sore withers and shoulders. Another nice treatment is to put the hand held sending unit over the croup area and let the sound waves spread from the Acupoint called; “Bai Hui” or “the place of 100 Meetings” in which all Yang meridians merge. (Re: Equine Acupressure by Nancy Zidonis). In fact, following along the meridian system is a very popular way of using the Qi Gong Machine. It is not an exact device for treating target points; See below for acupoint tools. The Qi Gong Machine allows you to utilize a simple to use tool, it does the work for you. I for one, do not have hands for doing traditional acupressure or massage work. I additionally like the fact that If the horse is extremely sore you can start treatment by just holding the transducer near the area. It is not mandatory to touch the site in order to give an effective treatment. This feature is very useful for a horse who is not ready to let you into his space. One example of a no-contact treatment is in the case of a painful abscess. Just hold near the foot for a few minutes to help disperse the build up of fluids. For a colicky horse, fresh tendon or suspensory ligament injury, or a horse that’s just crashed into something…….. It’s definitely become one of my favorite therapy tools. If you like to keep things simple, this should be your first therapy tool. Example: A perfect example of reducing swelling was after my older gelding (with a history of not responding well to injections) had his West Nile Vaccination. Within two hours my horse was very sick, sweaty, lethargic, and wouldn’t eat. The shot was given to my horse midday, and by the following day he still was not eating and had developed a large hard swelling at the site of injection about two inches in diameter. He was miserable! I treated my horse with microcurrent that morning and he was more comfortable, but the swelling hadn’t moved. That evening I tried the QI GONG MACHINE for about five minutes and watched as the swelling was literally reduced to half. My horse was actually getting fidgety and hinting he wanted back in his stall. I turned him loose and watched as he headed back to his stall and dove into his hay. The next morning I treated again and finished reducing the swelling down to nothing and turned him out to pasture. He was back to normal. Article Updated March 2017: Matrix Qi-SP is now the only infrasound therapy device available.